Things to do in Victoria BC by Bicycle. We want to highlighting things to do, see, eat and drink in Victoria BC for people visiting our city. We love to explore and find new things to do in our city so you can plan your trip! Few of my Favs right now are! Check out my google map! So excited to be one of the 200 vendors at Victoria's first ever Car Free YYJ! Definitely a thing to do in Victoria BC if you live here or visiting from out of town. 1st time ever Douglas St will be closed for a event like this. 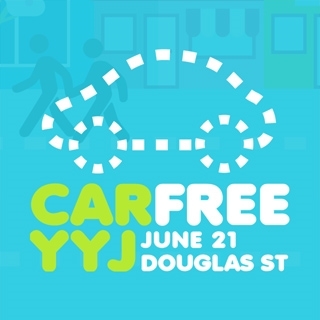 Organized by the Downtown Victoria Business Association Car Free Day Victoria is not to be missed, with 3 stages of live entertainment, 7100 square foot grassy park on Douglas St, farmers market and 3 craft beer tents this event should not be missed! Come down and see me and my marketing guru Lucy on Sunday June 21st, 2015 for some fun in the sun! Guided Bicycle Tours of Victoria, British Columbia, Highlighting the city's best parks, landmarks and top attractions by bicycle! All tours are set at a leisurely pace with plenty of stops for stories, photo ops and fun! Thank you for signing up, we look forward to connecting with you in the future!